Vintage - Stafford Teapot, Art Ceramic Pottery, Black Cat w/Red Bowtie and Lid, Hand Painted, Circa 1950's. 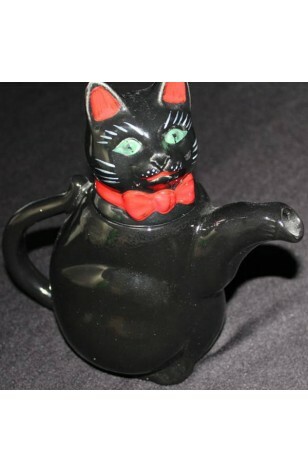 This beautiful Vintage, Black Cat Teapot, by Stafford Potteries, Made in England, in the 1950's, is a Very Glossy Black, with Bright Red Bowtie and Ears... Has Green Eyes, White Whiskers, Eyelashes and Nose details. Cats Tail Curves upward to make the Handle. Front Paws together are the Spout, and the Head is the Teapot Lid. This is in great condition, and Hand Painted. Any Collector would love to have this one for it is quite Unique. This beautiful Vintage, Black Cat Teapot, by Stafford Potteries, Made in England, in the 1950's, is a Very Glossy Black, with Bright Red Bowtie and Ears... Has Green Eyes, White Whiskers, Eyelashes and Nose details. Cats Tail Curves upward to make the Handle. Front Paws together are the Spout, and the Head is the Teapot Lid. In Very Good Resale Condition unless noted below or in pictures. Nicely Hand Painted. Any Collector would love to have this one for it is quite Unique.